Who's that man with the eight strong legs? In 2011, budding game developer Young Horses, Inc. launched a Kickstarter campaign with the hopes of creating a sequel to their student project Octodad – a video game that is exactly what it sounds like. 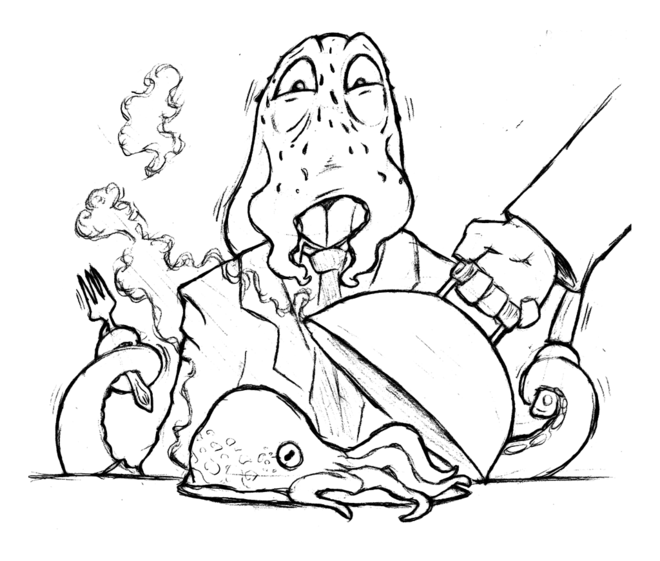 Enter Octodad: Dadliest Catch. All glistening eyeballs, burbling murmurs, and tentacles, neatly kept in check with a Windsor knot, he flails majestically through the atmosphere. 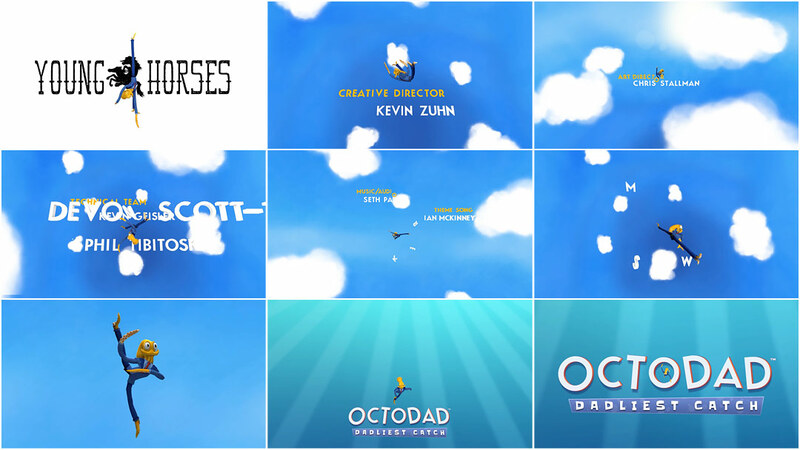 But Octodad’s weird cephalopod ballet through the wide blue yonder, tumbling past credits, isn’t a passive cutscene. With a few button presses his limp whirling becomes your own. You are Octodad, and you can thrash your freakish limbs into the very names of your creators. Putting a new spin on the film-before-the-film approach to opening titles that many movies take, Dadliest Catch presents the player with a sly little game-before-the-game. And it’s yours to enjoy if you’re savvy enough to spot it. A discussion with KEVIN ZUHN, KEVIN GEISLER, and CHRIS STALLMAN of game developer and publisher Young Horses, Inc.
Tell us a little about yourselves and your role in Octodad. KZ: I'm Kevin Zuhn, creative director. I did a lot of level design, prop art, and writing for the game. I've been developing games for as long as I can remember, but Dadliest Catch is my first commercial release! KG: I’m Kevin Geisler, producer, and one of two programmers. CS: I am Chris Stallman, the art lead. I was responsible for character creation, the architectural art for the levels, and worked with the other artists on the team to make sure that everything fit together. I also did animations in the game, but I had to give the majority of that work to Nick Esparza due to deadlines. How would you describe the game to someone completely unfamiliar with video games? 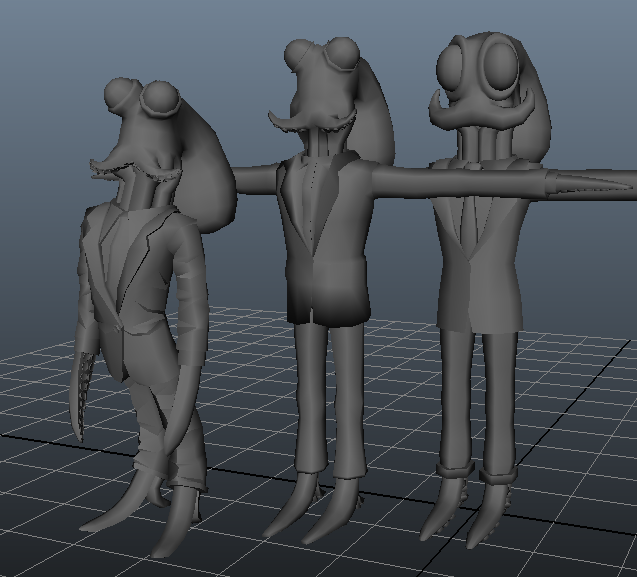 CS: Octodad is a game where you play an octopus wearing a suit in a world that believes he is just another human. This of course includes his human wife and kids. KZ: They don't know he's an octopus. You have to do chores and act like a normal human father to keep them and society at large from discovering your secret. But everything is harder when you have no bones, and you have to drag Octodad around one limb at a time, without letting his wiggly body knock anything over! So, let’s go back a bit here. 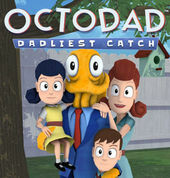 Dadliest Catch is the sequel to Octodad. 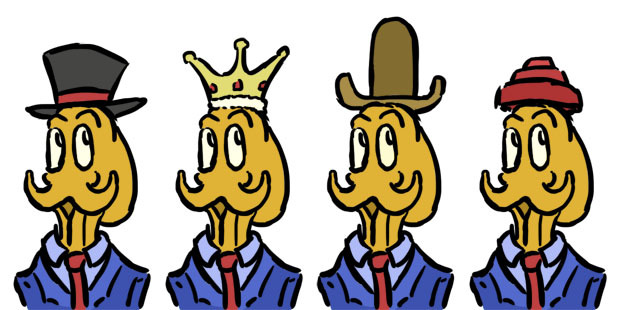 Where did the idea for Octodad originally come from? KZ: Octodad started as a student project at DePaul University. CS: It was birthed from the minds of John Murphy, Seth Parker, and Nick Esparza, during the DePaul Game Experience, DePaul’s yearly program to make a game to enter into the student competition at the Independent Games Festival. KZ: Our goal was to make something that could compete there. We went through a lengthy pitching process trying to come up with ideas that were completely new. Seth Parker, John Murphy, and Nick Esparza had watched a video of Jurassic Park: Trespasser, an old PC game with really bad arm physics. They thought it was really funny and decided to pitch a game where the arm and body controls were difficult on purpose. 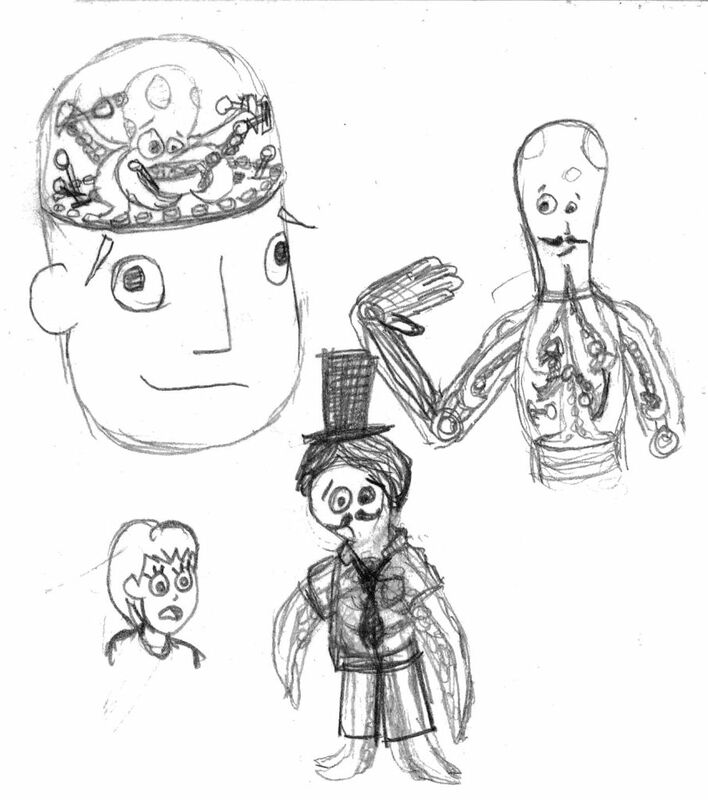 CS: The pitch featured a small tentacled alien inside a robotic body that infiltrated human society. It would control somewhat like Trespasser with its awkward floppy arms. KZ: Right, in the original pitch it was an octopus in a robot human suit, but when they brought it to the larger group we decided it would be funnier if he were just an octopus. CS: The alien became an octopus who then grew in size until a robotic suit was no longer necessary. He became a father of a human family, who had no idea he was anything other than human. It took a bit longer to figure out exactly how Octodad would move around – we just knew it would be awkward and imprecise. That was ironed out during prototyping. What were some of your other influences? KZ: I was pretty heavily influenced by cartoons like Animaniacs and The Simpsons, which I spent a lot of time watching as a kid! From video games, I took notes from Envirobear 2000, Minotaur China Shop, and QWOP, all games about wonky controls and destructive physics. At the beginning of the project I also spent time with stories where suburbia becomes absurd and terrifying such as Twin Peaks, Blue Velvet, and Brazil. Was it a response to anything you were seeing in games at the time? KZ: Octodad was born out of our attempt to do something brand new. We always had to be mindful of what other games were doing so we could stick out. There were an abundance of games about gravity, cloning, and time control. Octodad is like my thesis on those rules. Once you take out jumping on stuff and fighting things, you're left with everything else a character could possibly do. And you did a Kickstarter campaign, right? What was your Kickstarter experience like? CS: It was pretty crazy since we had next to no idea what we were doing. There was no finished content for the sequel [Dadliest Catch] at the time, just a rough framework and a ton of ideas. So we put together a trailer and our prize tiers as best we could and launched. KZ: For that time, before Double Fine broke open the Kickstarter scene, it turned out pretty well. 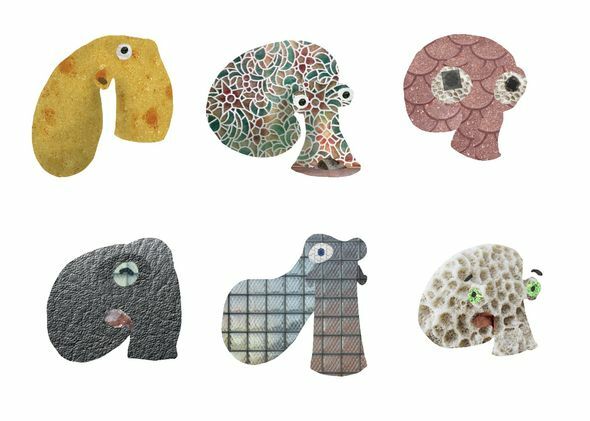 Our Kickstarter was a lot of work, and we made some terrible mistakes when offering rewards – namely, hand-sewn plush dolls! CS: We should have probably waited six months so that we could actually show what the game might look like when it was done, but we didn't know any better! On the plus side, not only was the Kickstarter successful, but more importantly, we confirmed that Octodad was something people might actually put their hard-earned money toward. KZ: What we really needed was the validation – some assurance that Dadliest Catch would be wanted. CS: It was such a relief to see that we had made our goal. So, why did you go with a title sequence? Why did Octodad need one? KG: Well, we wanted the opening level to be a flashback and felt that we needed something to segue between it and the following levels. We had developed a theme song for the game prior to creating the opening and thought it would make sense to incorporate it into the game via an opening credits sequence, similar to a Saturday morning cartoon. The title sequence was mostly an excuse to let the player hear the theme song, but it's a good marker to begin the actual story since the first level serves more as a tutorial. KZ: The tutorial church level in Octodad was originally meant to be a dream sequence. 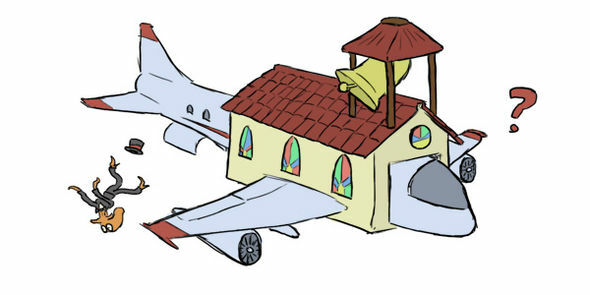 There was a joke around our office that the church was actually a giant plane and that Octodad would fall out of it after the wedding, so that lead to Octodad falling through the sky and then waking up in his bed. CS: We toyed around with the idea of walking around a dreamlike expanse, but the falling through the air was just more exciting. Falling dreams are pretty ubiquitous and it was nice to put a less fearful spin on them. KG: We also briefly discussed an opening where you'd simply walk from left to right through a hallway, with the credits on the wall behind him. How did you set about developing it? KZ: As a team we knew we wanted an opening sequence to show off the theme tune "Nobody Suspects A Thing" by Ian McKinney. The falling opening went well with playtesters, so we included it in our builds. Roughly a year into production, around May 2012, Kevin [Geisler] first created the opening credits sequence, more or less as an experiment. CS: He made the prototype on his own after probably watching too much Mad Men and it just stuck. I really just wanted a nice, calm, blue sky, filled with fluffy clouds. There was possibly a subconscious desire to mix The Simpsons title sky and the title sequence for Mad Men. KG: Yeah, I think the biggest influence was Mad Men, which it is partially referencing. I thought it would be interesting to hint that Octodad has this history of self-doubt and ultimately a fear of being forced to return to the sea. How did you decide to make it playable? KG: After deciding that he should be falling through the opening, we figured that people would be annoyed if they couldn't move him around! CS: Really, I think it grew out of our own playtesting. When things are unfinished, it’s possible to walk off the edge of the level and fall through space until you restart. People, including the team, really liked throwing themselves off the edge! Just falling and flailing about. We had to find a way to put it in the game and the title sequence just fit. So, it's playable because it's fun! We also felt that title sequences were a likely thing many people might skip, so making it playable was our way of combating that. It does a good job of getting the player ready for the rest of the game. It allows them to flail about, destroy things, and have fun doing it. The theme song helps get the player in the right mindset, too. It’s funny though, some people put down the controller during that sequence and just watch it, not realizing they can play it. I think they enjoy it much more when they realize they can. KG: We don't explicitly tell people, so it's kind of a fun discovery. KZ: So, Kevin Geisler continued to make subtle improvements to it. At the end of production, January 2014, Chris helped to improve the cloud particles and the backgrounds. 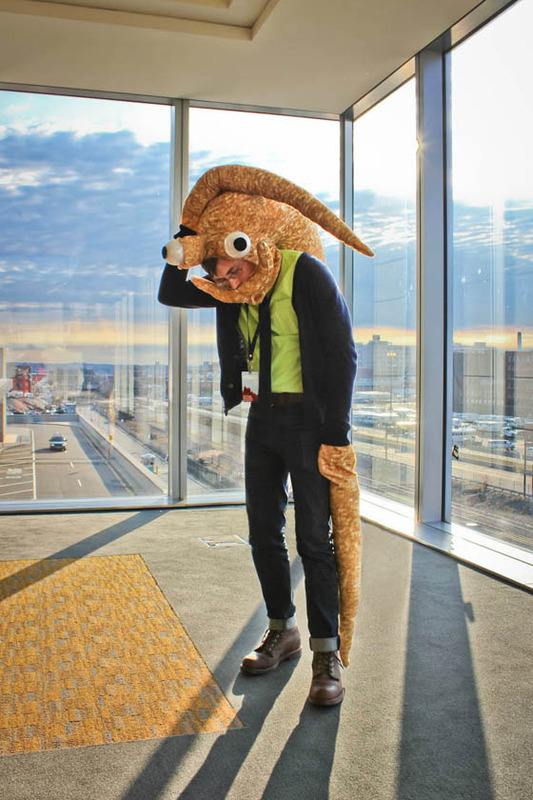 He was also responsible for making Octodad's model and the 3D text models. Did you encounter any challenges or bugs while putting it together? KG: Because of the distance Octodad was falling, we had one bug where he would veer too far from the origin, causing his pupils to not show up, making him look pretty creepy! Also, we had to not allow players to move his arms since it caused him to float, making it easy to just float among the letters sometimes. CS: Yeah, and the arms would slow his fall too much. Granted, that is only an unfortunate problem when someone is playing co-op and can't control anything during the sequence. The weirdest bug we ran into was, for whatever reason, Octodad would occasionally hit one of the names and instead of continuing his descent, would change directions and start flying upward, gaining speed as he floated skyward! Is there a “right” way to play the sequence? KG: Not really, but I have a lot of fun trying to hit as many letters as I can! CS: Some people try to destroy our names! As long as they are having fun, then they are playing it the right way. Let’s talk about Ian McKinney’s theme song. When was that written? CS: It was written in February and March 2012 for our first teaser trailer. When we were still students working on the original Octodad, we found this song on YouTube called "Octopus I Love You" by Dalmatian Rex and the Eigentones. We really liked it and contacted them to ask permission to use it in our trailer. 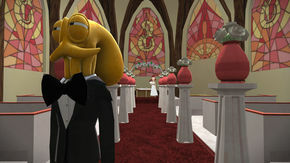 Thankfully they said yes and it became the unofficial theme to Octodad. We really wanted to have another catchy tune for Dadliest Catch so Devon Scott-Tunkin, one of our programmers, started writing some ideas up himself. He contacted his friend Ian McKinney and had him start working on a theme. KG: One of the ideas they came up with had a surf rock style to it and it very quickly became our choice for the trailer. CS: We knew that we had found our new theme. We are just glad that everyone else likes it as much as we do! KG: We didn't realize how popular the song would become, and ended up incorporating it into future trailers and the game itself. KZ: I love “Nobody Suspects A Thing” and I still listen to it! It helps that it's been remixed a few times. These days I listen to the Berry Gordy mix heard in the end credits. I've gotten sick of a lot of parts of Octodad, but for some reason that song has never been one of them. CS: I really like it. There are some issues with the lyrics that don't exactly match Octodad's reality, like the fact that he does not wear a three-piece suit, but that doesn't detract from it. People really like pointing that out, though! Was it inspired by Devo? It’s got a great Devo-like sound. KG: I'm told that Ian, who wrote the song, is always inspired by Devo and that it is his favorite band! What are some of your personal favorite title sequences, either classic or contemporary, in games, film, or TV? KZ: My favorite title sequence is probably the police car 'chase' in The Naked Gun, and the continuation of the gag into its sequels. I also like the jazzy anime openings in Cowboy Bebop and Baccano! For something more contemporary, I'm really captivated by Orange Is The New Black. KG: I think Casino Royale has one of my favorite openings of all time. I enjoy title sequences that show up unexpectedly and have really powerful songs behind them. CS: I really like opening title sequence to Kung Fu Panda, the animation and style is just so inspiring and instantly grabs you. Wall-E's end credits are also great – it's always a pleasure to see a story continue into the credits. Many ’80s cartoons, like Thundercats, had great openings. The higher budget animation and catchy themes promised so much. It's too bad the shows rarely delivered. What about title sequences in video games? Any recommendations? KZ: You should check out Jazzpunk! The title sequence is really exciting, and the game itself is absurd, funny, and unique. KG: Final Fantasy VII has one of my favorite title sequences because of the way it shows the different magnitudes of the story, starting from space, zooming in to the character Aeris, zooming out to show the city – and title – and then back to the main character, Cloud. I also love the way the music is done and how it is referenced in the ending sequence as well. CS: A title sequence that has stuck with me for a long time is the opening to Medal of Honor: Frontline. It is an edited re-recording of General Dwight D. Eisenhower's speech on D-Day with stock footage of troop movements, ships, and landing crafts for visuals. In the background was Michael Giacchino's great orchestral score. As a kid watching that, I was so inspired and excited to start playing the game and still remember it to this day. If you had some advice for someone looking to make a video game, what would it be? KZ: Start immediately! There's no sense in waiting if you're going to express yourself or break into the market. Learn Unity, GameMaker, Unreal, or Twine and make whatever fascinates you. The tools are getting easier and cheaper to use every year and there are tutorials all over the internet. If you just want to practice using the programs, try to replicate one of your favorite games. Once you're ready to release something, though, try to make the game that only you would or could make.